Totopara – It is a small village located on the banks of River Torsha bordering Bhutan in the Jalpaiguri district of West Bengal, India. This village is the only habitation of Toto, a primitive tribe in Dooars which is 30 km away from Jaldapara. The village is about 22 km from Madarihat, which is the entry point of the famous Jaldapara National Park. It is bounded by the foothills of Bhutan to the north, Torsa River to the east, and Titi river and the Titi reserve forest on the south-west separated by the Hauri river. Chilapata– Hidden deep inside the Chilapata Forests the ruins of a thousand yeas old fort of Nal King has a tremendous historical and archeological importance. On way to Cooch Behar, a trip through the deep and dark Chilapata Forest (20 km from Alipurduar) is a pleasant and exciting experience. Built in the 5th century during the Gupta Empire the ruins still recall the memories of the Golden Age of India. Gorumara National Park– Gorumara National Park is 80kms from Jaldapara.Gorumara National Park is situated on the bank of rivers Murti and Raidak in the terai region of Dooars on the foothills of Eastern Himalayas. 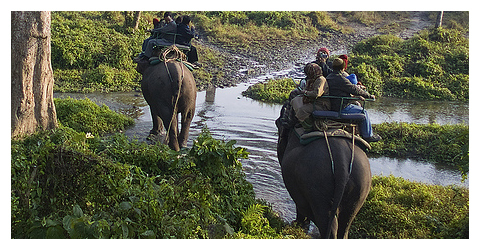 Gorumara is famous for its Asiatic one horned Rhino, Asian Elephants, Bisons, Peacocks. This was a reserve forest since 1895. In the year 1949, the park was declared as Wildlife Sanctuary for its breeding population of one horned Indian Rhinoceros. On January 31, 1994, it was declared as a National Park. The 80 sq. km area of the Gorumara National Park is famous for its rich variety of flora & fauna. The park is located in the Malbazar subdivision of Jalpaiguri district, in the state of West Bengal in India. The Murti, Jaldhaka, and Indong rivers flow through the Park on the foothills of the Himalayan ranges in the North making the whole region picturesque. The park offers breathtaking landscape with its rivers and mountain ranges. Lataguri a small town adjacent to the park is the entry point. Phuntsoling – Bhutan: 32km. Phuentsholing (also sometimes spelled Phuntsholing), the second largest town in Bhutan (population around 40,000), is on the Indian border, next to the town of Jaigaon. Phuentsholing is the point of entry for travelers arriving by bus from Kolkata and Siliguri and the town functions primarily as a place where Bhutanese and Indians do business. The architecture is modern, and there is no dzong, famous monastery or in fact anything of particular interest to tourists. However, like all of Bhutan, it does offer a clean, pleasant and safe environment in which to go about your business. NB: Until 2005, it was possible for overseas visitors to enter the town without a Bhutanese visa. Except for Indian nationals, this is no longer possible. Indians are denied entry beyond the checkpost in the absence of a permit. Buxa Tiger Reserve– It was established in the year of 1982-83 to save the most important species of North Bengal The Royal Bengal Tiger. The park is located at the north eastern corner of Dooars plains of North Bengal bordering Bhutan and Assam. The core area of 315sq.kms around the Buxa Duar Fort was declared a National Park in January 1992. It is 56 kms away from Jaldapara. This tropical rain forests having an annual rainfall exceeding 5000mm has 150 species of plants and a variety of creepers, grasses, bamboo and cane along with some rare species of orchids. Trees like Teak, Sal, Simul, Sishu are found in great numbers. Because of its wilderness and difficult terrain most part of Buxa still remains unexplored. So far 67 species of mammals, including 23 endangered ones and 36 species of reptiles have been recorded in Buxa. The most important animal here is the Royal Bengal tiger. Jayanti – Jayanti is 75 kms from Madarihat a beautiful picnic spot on the bank of Jayanti river. It provides an excellent view of the hills of Bhutan and attraction of flora and fauna of the region. Bhutan Ghat – It is 85 kms from Madarihat, the road passes through beautiful forest and tea gardens. and a picnic spot.